LONDON--(BUSINESS WIRE)--Technavio market research analysts forecast the global contactless point of sale (POS) terminals market to grow at a CAGR of close to 26% during the forecast period, according to their latest report. The market study covers the present scenario and growth prospects of the global contactless POS terminals market for 2017-2021. The report also lists the retail and hospitality sector as the two major end-user segments, of which the retail sector accounted for over 66% of the market share in 2016. The contactless POS terminal is fast and reliable. The time taken for a single transaction is much lesser than the traditional chip and PIN method. The users have a higher value addition as they do not need to key in the PIN in public or hand the card to the POS operator. For the merchants, the value addition lies in faster check out times. The merchants save time as more customers can keep moving through the terminal faster. This also helps in forming smaller queues in front of the payment terminals. The increasing awareness about near field communication (NFC) technology among merchants has resulted in the growing adoption of NFC POS terminals and has, in turn, fostered the growth of the global contactless POS terminals market. NFC POS terminals help merchants attain operating cost benefits such as reduced cash processing and more effective consumer engagement. Apart from providing easy and quick transactions, merchants can employ NFC POS terminals for loyalty programs, marketing, and providing information about products customers are likely to purchase. Therefore, these benefits associated with NFC POS terminals could lead to an increase in their demand among merchants, increasing the growth prospects of the market. “With the increasing availability of smart devices in the market, there will be a substantial increase in the number of contactless mobile POS terminals as well,” says Chetan. Leading smartphone OEMs like Apple and Samsung have launched their very own contactless payment options. The Apple Pay application uses the smartphone and the smartwatch's inbuilt NFC technology to make contactless payments. The Samsung Pay application on Samsung phones also uses a similar NFC technology. However, unlike NFC-enabled cards that do not require authentication, Apple Pay and Samsung Pay have the option to enable fingerprint or password authentication before making the transaction. Apple Pay and Samsung Pay use the credit cards, debit cards, and other payment data from the e-wallets or any bank and use the NFC technology to make the transaction at the contactless NFC-enabled POS terminal. Currently, Samsung Pay is available only in the US and South Korea. Samsung Pay uses the debit or credit card details of any bank that need to be stored and set up, and it uses the NFC technology to make the transactions at NFC-enabled POS terminals. Google had introduced this feature in 2011 for NFC-enabled Android phones. Become a Technavio Insights member and access all three of these reports for a fraction of their original cost. As a Technavio Insights member, you will have immediate access to new reports as they’re published in addition to all 6,000+ existing reports covering segments like displays, embedded systems, and human machine interface. This subscription nets you thousands in savings, while staying connected to Technavio’s constant transforming research library, helping you make informed business decisions more efficiently. 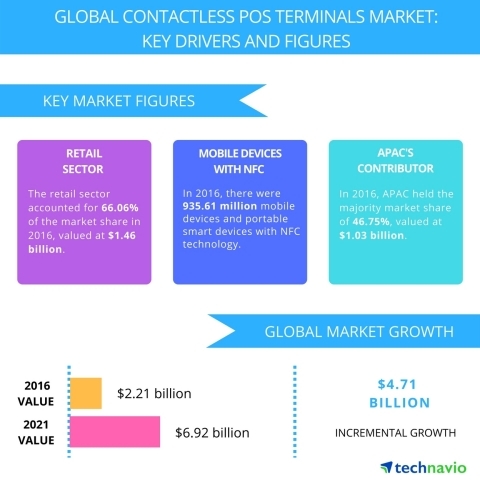 Technavio market research analysts forecast the global contactless point of sale (POS) terminals market to grow at a CAGR of close to 26% during the forecast period, according to their latest report.